This beautiful shade tree has glossy, dark green leaves with a silky bronze color underneath. 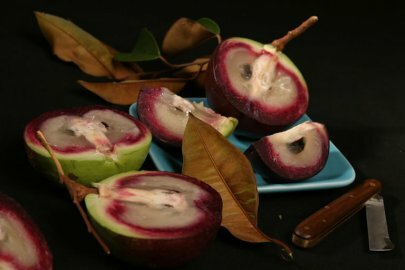 Caimito is a favorite in the Caribbean and Central America, as well as Southeast Asia. 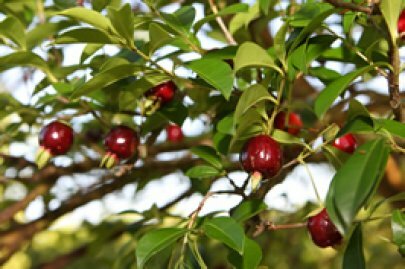 The fruit has a mild grape-like flavor, and is best eaten fresh. 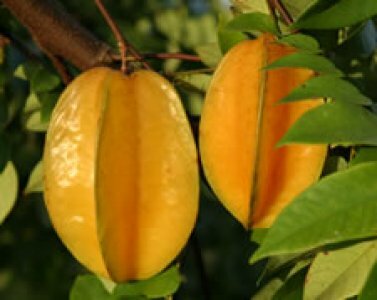 The Canistel is a large, open, evergreen tree that has dark green leaves up to twelve inches long clustered at the tips of the branches. 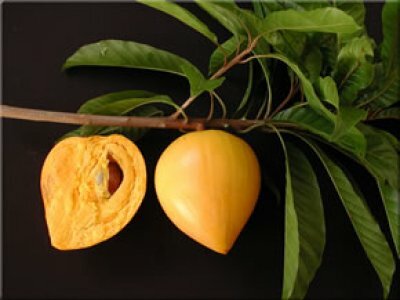 The fruit has a thin orange to yellow skin, and the pulp is dry like the yolk of a hard boiled egg. They are commonly eaten fresh, used in cooking and pies, and they are excellent in ice cream. In milk shakes they taste like eggnog. They are very similar in taste to the Lucuma from Andean countries. Carambola are small symetrical trees that fruit very prolifically. They are commonly eaten fresh, in salads, as garnishes and in drinks. The fruit have a sweet citrus-like flavor that is both delicious and refreshing. The actual fruit is the nut, the "apple" is a swollen stem. 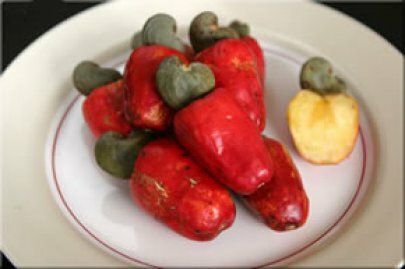 Cashew "apple" is eaten fresh, candied, or stewed. They have a sweet and astringent taste, and are somewhat chewy. The nut itself is caustic until roasted, and they should be roasted outside because the fumes can be irritating. Under favorable conditions they can grow very fast, and they can fruit in just two years. The plants tolerate very poor soil and drought, but they are very cold-sensitive. This delicious cherry is typically 1-2 inches long and oval in shape. When ripe, they are deep purple to black and have a full cherry-like flavor. The trees can be grown in large pots, hedged, or used as a specimen. This beautiful tree has large, dark green leaves that shade the fruit pods which grow directly from the trunk and branches. The flesh is eaten as a dessert, and the seeds are the raw material of commercial chocolate. Hot chocolate can be made by drying, roasting and grinding the seeds, and then adding milk. 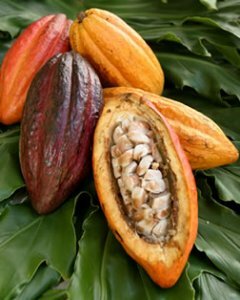 Chocolate "beans" were used as money by the Maya Indians of Central America. The red pods are typically larger and have more abundant flesh. Cinnamon is an evergreen shrub or small tree with dark, leathery, aromatic leaves. In cultivation, young trees are cut back twice a year and sucker shoots develop from the roots. These long slender shoots furnish the bark that is the commercial product. The leaves are used in tea. 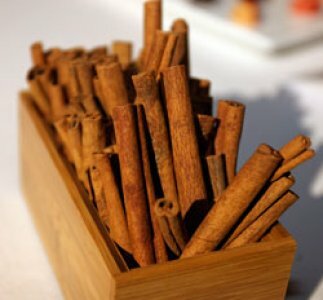 Cinnamon is a very popular culinary spice and it is also used in candy, gum, incense, toothpaste and perfumes. The oil is used in medicine as a carminative, antiseptic, astringent and as the source of cinnamon extract. 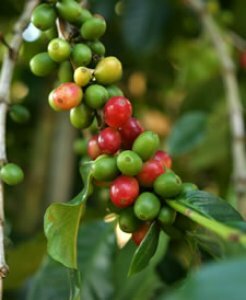 Coffee plants have small white, fragrant, star-shaped flowers that are clustered in the leaf axils. They resemble gardenias, to which they are related. The edible fruits are small fleshy berries changing in color from green to yellow to red. Two greenish-gray seeds are covered with a thin membrane and are enclosed in a dry husk-like parchment. When only one seed develops, it is known as a pea-berry and commands a higher price. The seeds can be easily dried, roasted and ground at home. This climbing cactus is one of the most beautiful and widespread members of the Cactaceae family. The magnificent night blooming white flowers can be up to 14 inches in diameter. The fruit is most often eaten chilled and cut in half so that the flesh may be spooned out. The juice is used in frozen drinks and it has even been used as a Tropicana Twister flavor. The red fruit are high in lycopene, which is a natural antioxidant that is known to fight cancer and heart disease. With a history that dates back to 5,000 B.C. the edible fig is one of the most widely recognized and distributed fruits in the world. They were first introduced to the New World through Mexico in 1560, and then to California in 1769. 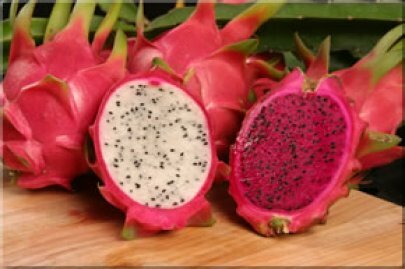 It is one of the few fruits that can be grown in all fifty states, and there are a multitude of varieties suitable to each growing region. 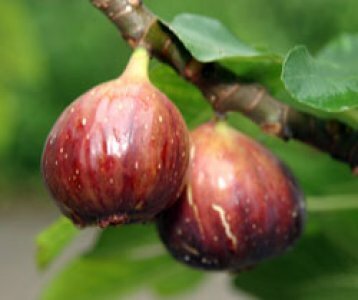 The Black Mission and especially the Brown Turkey variety are the two best figs for tropical and subtropical climates.